Open a new image 800 x 800 or one you prefer, paste paper 4, apply your mask, delete and merge group, resize larger to 105%, then paste paper 1, apply the mask again, merge down. Paste the wire on the mask, change the blend mode to Luminance (L). Paste frame 8 on the wire layer, resize larger to 110%. Paste frame 4, click inside with your magic wand, expand by 5, paste paper 3, invert, delete, select none, move below the frame. Being on the top frame layer, resize your tube to 45%, paste on the right side. Paste the Gold at the bottom, duplicate twice, move one over to the right and the other over to the left. Paste the word Luck on top of the gold layers. Resize the horseshoe to 45%, free rotate to the right at 20 degrees, duplicate, mirror, moving both below the gold layers. Corner flower line, free rotate at 90 to the left, move to the bottom below the tube layer. Paste flower 3 below the corner flower layer on the right, duplicate, mirror, move down some and erase any stem showing below. Resize flower 1 to 85%, paste on the paper layer below the window, sharpen once. Resize the original flower 1 to 70%, paste above flower 3 layer on the left, sharpen once, duplicate, mirror. Resize the leaf vine to 25%, paste below the corner flower layer on the left, duplicate, mirror, duplicate again and move over some. Resize the dragonfly to 30%, place where you like, duplicate and mirror and place again where you like. 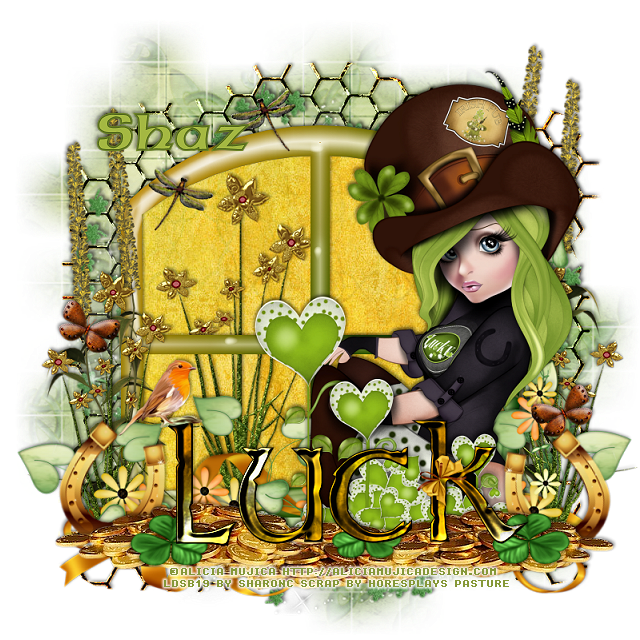 Resize clover 1 to 20%, paste on the gold coins, duplicate a couple of times, place where you like. Resize the bird to 30%, place where you like, I placed mine on the wordart. Resize the butterfly to 15%, free rotate to the left at 25, place where you like, duplicate, mirror. Resize ribbon 2 to 80%, free rotate to the left at 90, place below the gold coins at the bottom, duplicate, mirror, move up some. Resize bow 4 to 15%, place on the letter K of the wordart.